Champions of Regnum (CoR) is a uniquely balanced game that allows for both intensely competitive PvP (Player vs Player) as well as deeply engaging PvE (Player vs Environment) gameplay. This means that you can choose your style of play simply by how you develop your character and the areas you choose to visit. Each realm in CoR is a region of the world that is for the most part inhabited by allied players. Each realm or zone is then further divided by walls, bridges and water that keep different difficulty areas apart. The first area of a realm is where you can explore safely. 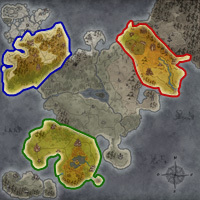 The towns will hold quests that will teach you about the game while unraveling mysteries and stories about the region. You can choose to play quests in this area or explore on your own and grow your character up. 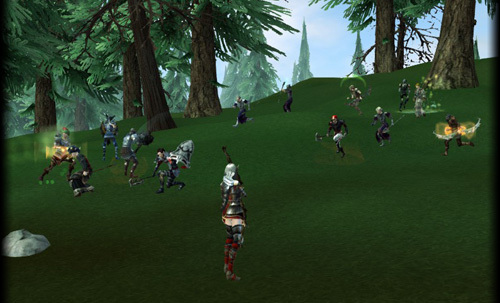 The inner realm is a tougher zone with more challenging quests and hostile creatures. You can choose to follow the story and quests to further develop your character or you can join friends and parties to attack the hostile creatures while exploring the rest of the region. Once you feel you are ready for it, you can cross into the War Zone. Here you'll find the game's PvP areas. 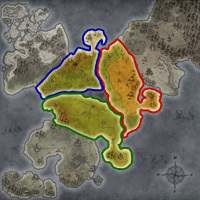 It is here that the three realms clash in open war, and here is when you will most likely join a clan and choose to defend the forts and castles of your land or lead attacks on enemies'. Remember that you can always move between zones and regions to play CoR the way you choose! For more information about PvP read the Battling section. For more information on PvE read the Questing section.